DHG INC is looking for your help to further our ability to provide giveaways and tournaments for all members. We greatly appreciate any contributions that you are willing to give. 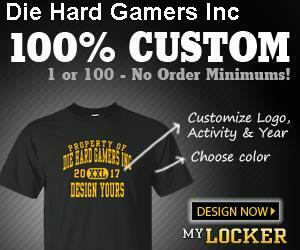 Die Hard Gamers Inc is a registered Public Charity in the United States. Official Donation receipts are available for tax purposes. Thank you! ANY BO4 PLAYERS THAT RE ACTUALLY ONLINE !? I was supposed to get added to some chat? TARSIS IS DOING A DHG WIDE RECRUITING DRIVE! CHECK MY PAGE FOR THE INFO! hey love ya DHG family!!!!!! ANNOUNCEMENT: SMASH is doing a recruitment drive for 15$(sponsored by Havoc DHG)! The first person to recruit a successful 10 recruits into SMASH JACKHAMMER wins 15$. I challenge you to take my money. I hope y’all have a good day! See you at the poker tourney tonight at 9 PM EST! You can do it, Dream! Think about this: when you play Rekoning, you go through the Derelect and then get transported into Unknown Space, home of Trials of the Nine. Does this mean Trials took place in the Derelect all along? Who's excited for Season of the Drifter? Well I must say, whoever did the details on the new D2 awards did a nice job. They look good. Die Hard Gamers Inc. is registered as a 501(c)(3) non-profit organization. Contributions to Die Hard Gamers Inc. are tax-deductible to the extent permitted by law. Die Hard Gamers Inc.'s tax identification number is 46-1538161.